Mercedes-Benz has lifted the covers off its all-new A-Class; the latest in a generation of cars that the German manufacturer believes will redefine modern luxury in the compact class. Set to be one of the crowd-pleasing attractions at the Geneva Motor Show, this latest A-Class takes over from a bestseller that has given the brand a distinctly more youthful fan base since its introduction in 1997. Though numerous body changes have been introduced to give it a noticeably larger and even more energetic appearance, the most obvious overhaul can be seen in the interior, which now exudes a sense of spaciousness and features avant-garde dashboard design and control and display systems. Arguably its most ingenious feature is an ultra-modern multimedia and infotainment system, one of whose characteristics is a capacity to ‘learn’ thanks to its use of artificial intelligence. This intuitive operating experience is said to significantly reduce driver distraction. At its heart is a high-resolution touchscreen operation that features a navigation display with augmented reality technology, plus intelligent voice control with natural speech recognition. Some features in the new A-Class are drawn from models that rank above it in the Mercedes-Benz stable. For example, its multifunctional steering wheel is derived from the S-Class while its front seats incorporate comfort features from its more luxurious siblings, including seat climate control, multi-contour features and a massage function. A range of new engines comprises two 4 cylinder petrol options of 1.4 litre and 2.0 litre capacity, and a new 1.5-litre diesel with power outputs in the 116 to 224hp range initially, with higher performance AMG versions following. These engines are mated to either a 6-speed manual or 7-speed automatic transmission. Advanced safety systems include see-ahead camera and radar with up to 500 metres range plus many active features now common in Mercedes-Benz models, including Lane Keeping, Adaptive Braking, and various Distance Control and Driver Assist systems. Model range and prices will be announced closer to launch. 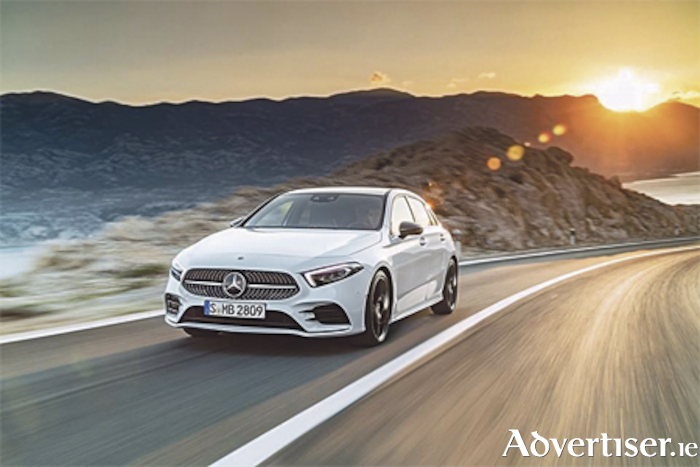 For more information on the new Mercedes-Benz A-Class please contact one of the dedicated Mercedes-Benz team at Michael Moore Mercedes-Benz on (090 ) 6403000.